In the last five years the ‘Superfood’ phenomenon has cemented its place in our consciousness, with new foods regularly being awarded the moniker. Each new discovery seems to surpass the last, and though you would be forgiven for thinking that they may be rather faddy and hold little of the merit bestowed upon them, in fact you would be wrong. Superfood’s are exactly what they say they are – being generously christened on account of their exceptionally high nutrient content. 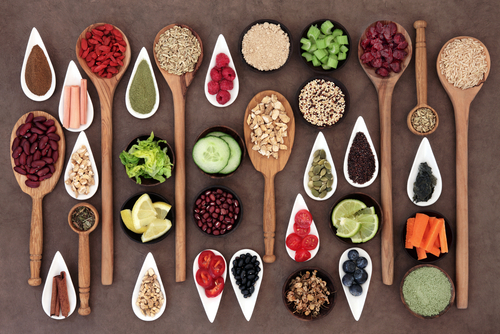 Though many foods considered typically healthy often contain high levels of nutrients such as vitamin C, antioxidants, minerals and proteins, Superfoods are turbocharged, containing a whole wealth of nutrients that have the potential to provide the body with all round nutritional support. The beauty of these is that they are food form, which maximises the chance of goodness being absorbed into the body, delivering a perfusion of goodness to many organs, cells and and systems. One often asks whether we really need this level of goodness? Bluntly, the answer is absolutely yes – probably more so than ever. We live exceptionally busy lives and what with work, play, sport, family, travel and a vast to do list it can be hard to ensure you’re getting all the goodness you need through the diet alone. That’s not even considering the fact that we sometimes indulge on naughty foods, booze and the odd cigarette; all whilst breathing in polluted air. Consider too that much of the western diet is often processed, pesti-cised, and well-travelled meaning that by the time it reaches our plate, a significant amount of the nutritional value may well have been lost. Superfoods are therefore an exceptionally easy and yet powerful tool to help to strengthen the nutritional foundation of the diet; something which is particularly pertinent for the health conscious consumer. Why? The moment I heard about the level of goodness in algae’s like spirulina I had to have some, and not a day goes by now when I don’t get it in some capacity. Algaes like chlorella, spirulina and Klamath blue/green algae grow in fresh water and are some of the most nutrient dense foods on the planet. Being 70% protein, they contain good levels of all 8 essential amino acids, as well as healthy fats and a whole complex of nutrients such as B vitamins, vitamin C, D, A and E; with high levels of minerals such a calcium, magnesium, iron, selenium and zinc. This makes them especially useful for vegans and veggies who are at risk of deficiency of many of these essential nutrients. With over 65 supportive compounds, alages are a unique complex of nutrients that make them one of the most turbocharged superfoods. They can be used to support a whole myriad of body systems from liver, immunity, skin, energy, brain and hormones and are also natural chelators, helping to bind and safely remove toxic compounds from the body. How? No denying it, they taste VILE and so don’t be tempted to add it to water unless you really want to punish yourself. Instead add to smoothies, juices, or homemade protein bars, or use it as part of a powdered formulation. Equi supplements cleverly mask the taste with natural flavours along side a host of other superfoods, antioxidants and herbs, so much so that it tastes great in water. You also buy capsules or spirulina tablets . Why? These intensely dark purple berries closely resemble the blueberry, but even they paleFullSizeRender into insignificance next to these turbocharged gems. Acai are from Brazil, where they have long been savoured and well acclaimed as a health giving fruit. Having one of the highest ORAC antioxidant scores of any food, they deliver high levels of protective compounds that help our cells shield themselves from harmful free radicals that can damage our internal structure and function. How? Being traditionally added to breakfasts with yoghurt, fruit and nuts in Brazil, the powder makes deliciously bright purple acai bowls. Their berry flavour is faintly sweet meaning they can also be blended into smoothies, deserts and added to porridge or granola. Not one to hit the limelight yet, but I have no doubt that acerola cherries will get their 15 minutes. The reason being that they are one of the most potent sources of vitamin C, a nutrient which is of course totally indispensable for health throughout the entire body. Immunity, collagen production, detoxification, neurotransmitter production and energy cycles all rely on it’s presence. Many vitamin and mineral supplements contain vitamin C in it’s synthetic version. ascorbic acid. Whilst some of this may be absorbed, research has shown that vitamin C in natural forms is better utilised by the body and less acidic. How? Acerola cherry can be found in powder form which can be added to water, shakes, juices, smoothies and sweet desserts. Also look out for it in Superfood blends. Why? This delicacy has a history that’s equally as rich and compelling as its taste, and having an impressively high antioxidant score, cacao’s nutritional values pack a punch as well. Cacao is also one of the most magnesium rich foods there is which makes it ideal for muscle relaxation, brain support and energy production. Cacao is also a rich source of endorphins, meaning that the claims behind it’s mood elevating properties are somewhat true. How? Cacao is brilliant for healthy cooking as it can be added to smoothies, healthy brownies and even raw Nutella to achieve the chocolaty taste but with all the goodness and none of the sugar. Why? The superfood-du-jour, moringha has burst onto the scene this year, and no wonder when you consider just how much goodness each hit contains. It’s been dubbed the ‘natural multivitamin’ because it contains pretty good levels of many vitamin and minerals (especially calcium, zinc, magnesium and B1) as well as a full profile of amino acids and antioxidants.